I used to write posts like this ages ago (over a year now) before I stopped for reasons completely unknown. Maybe I didn’t have time or they weren’t well received, but I’m bring ’em back and am determined to share the love! It might only be once a month, but feel like the community needs to support bloggers that they adore a bit more. It’s nice to tell someone that you appreciate their hard work, isn’t it? Memoir Mode | First of all, can we address the princess/mermaid hair that Kylie has? I am eternally jealous as her hair is completely amazing! Following that, I really love her style and she shoots her outfit photos beautifully. Kylie often includes other types of posts on her blog (her daughter’s birthday party looked amazing!) so there’s plenty to become obsessed with. Shot From The Street | I feel like Lizzie could go shopping for me and I’d adore every single thing she picked. She’s honestly my style sistahhh. I love this girls fashion sense, as it encompasses the whole boyish but feminine, oversized and relaxed feel that I really covet. She’s enabled a few purchases now and is definitely one I’ll continue to read! Lydia Elise Millen | Lydia is one of the sweetest people I’ve had the pleasure of chatting with on twitter. I appreciate her love for high end accessories and the mix of personal style and health/fitness on her blog. She’s a lovely person with a killer figure (and hair!) and a wardrobe to boot. If you don’t follow her – get to it! Ally in Blunderland | I’m quite a new reader to Ally’s blog but it’s one I’ve totally fallen in love with. Aside from being a fringe twin, I really love her sense of style and the way she takes her photos. She also covers beauty and runs a youtube too, so she’s an all round winner. Ropes of Holland | I’ve stalked Lindsey’s for a long time (creepy? whatev) and I think I’ve loved pretty much every single outfit post. Again, she has that casual vibe that I really love, but presents it in a really accessible way where you can see yourself in the pieces. I wouldn’t mind a hunt through her wardrobe! Thunderlove | I’ve been reading Natalie’s blog for a little while now and I really like her to the point posts. Her reviews (and youtube) are easy to follow and her photos are always lovely. She’s super pretty too and I have serious hair envy. Go check her out! That Grace Girl | A new(ish) beauty read to me, but I can tell Grace’s blog is going to be a long term favourite. Aside from my love for her minimal (think lots of monochrome and marble) aesthetic, her approach to beauty is a really refreshing one. I love the style of her posts and her photos are beautiful! That’s Just Fabulous | When you click on Faith’s blog you’ll realise exactly why I love it. It’s everything I wish my blog was! Her photos are simply gorgeous, vibrant and perfectly composed plus her actual content is amazing too. She has a seriously lovely blog and you should definitely read it! 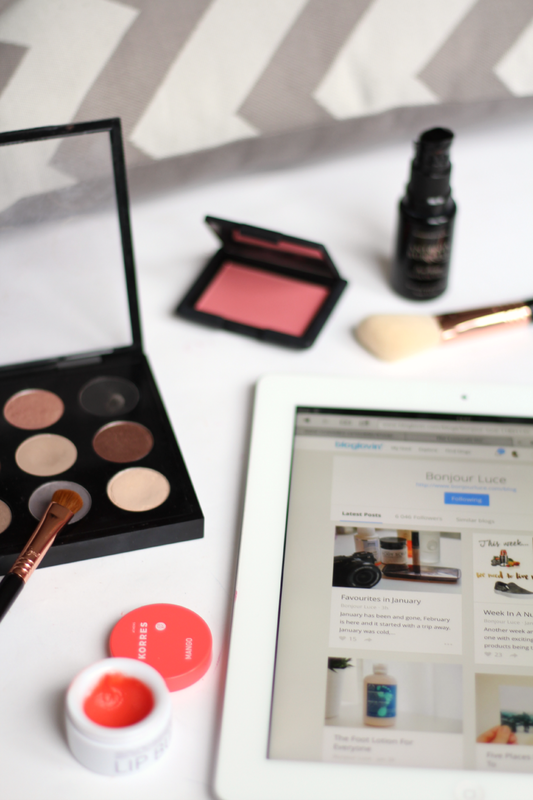 Makeup Savvy | If you like clear photos, hauls, places to grab beauty bargains and new releases – Fee is your gal. I’ve read her blog for years and it’s one I always refer back to for her reviews and her tips. She’s lovely too so if you’ve been hiding under a rock and don’t already follow her, head on over! Bed in the Kitchen | Jay runs a lovely little blog which includes everything from first impressions to what’s on her face to advice style beauty posts. I like the way she presents everything and her posts are easy to digest! Rosy Layers | I adore Julia, I don’t know what it is specifically but I think we could totally be irl best friends. She’s really sweet and runs a gorgeously designed and put together blog over at Rosy Layers. I love how creative her posts are and the photography is always amazing! She blogs about everything from style to beauty to lifestyle, so make sure you stop by! Fine and Dandy | Claire. Oh, Claire. My favourite Irish bundle of joy. I’ve met this wonderful human in person, as she lives in Newcastle and she’s the sweetest person and is always so, so nice to people online too. She runs a little lifestyle blog, covering all sorts of topics from things she loves to uses for washi tape to how to be less stressed. She’s a gorgeous person inside and out, so stalk her blog immediately! Bonjour Luce | As you can see from the above iPad image, I couldn’t not include the lovely Luce in here. There’s something quite escapist about her blog and I love reading all of her posts from beauty to restaurant reviews. She makes me want to chop my hair off too so I can style it like hers! Perfect. Diamond Canopy | Where shall I start with Winnie’s blog? I think the photography was the first thing that drew me in and I’ve followed her blog ever since. It’s seriously inspiring and makes me want to work harder at mine. Winnie is such a lovely person too and her restaurant/lifestyle posts are my favourites to drool over. Little Winter | When I think of Katy’s blog the word ‘awww’ comes to mind and that’s mostly because of her adorable new kitten! She posts the cutest photos of her and her family, which is weirdly heartwarming yet completely lovely and a blog to read with a hot chocolate on a cold day. Such a gorgeous slice of the web! Hope you find some new reads and remember to stop by your favourite blogs to remind them why you keep coming back! What are your favourite blogs at the moment? Next Post TODAY: All Back with Missguided plus a Giveaway!